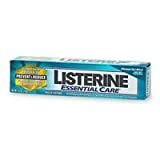 Named after the father of antiseptic surgery, Joseph Lister, it’s no surprise that Listerine Toothpaste puts a strong emphasis on killing the germs that cause bad breath and other oral health problems. It also removes stains and contains fluoride to prevent cavities and strengthen tooth enamel (view on Amazon). An effective oral hygiene regime is essential, not just for your smile but for your overall systemic health. At the heart of this regime is the toothpaste you choose. Your mouth is an entry point for a lot of bacteria and it is essential to choose a toothpaste that helps to prevent this bacteria from getting into your body – as well as cleaning and protecting both your teeth and gums. But toothpaste is a universal product, so companies know there is serious money to be made from marketing it. Consequently there are hundreds of toothpastes to choose from and a minefield of competing claims for their effectiveness. This article is here to help you decide whether Listerine Toothpaste is right for you. 2.) Will Listerine damage my teeth? 3.) Does Listerine protect your teeth? 4.) How does Listerine taste? * By making you enthusiastic about brushing because it tastes good, feels good or is really effective at what you want to achieve, for example a whiter smile. Makes you want to use it? Clean feel, nice texture – gel rather than paste. Listerine Toothpaste is a gel style toothpaste that tackles the bacteria that cause bad breath and contribute to other oral health problems such as plaque build up and gum inflammation. It also uses a fluoride formula to help strengthen tooth enamel, protect against decay and removes stains. Established brand for anti-bacterial products helps overall gum health. Gel formula works well with sonic toothbrushes – no spatter. Flavour is not to everyone’s taste. A little more costly than regular toothpaste. Listerine Toothpaste is clinically proven to prevent and reduce plaque, gingivitis and bad breath. It is the mouthwash dentists recommend most for healthy gums. It aids in the prevention of: Cavities, Plaque, Gingivitis. Antiplaque, antigingivitis and anticavity fluoride toothpaste. Listerine Toothpaste is a popular toothpaste from a company with an established reputation for antibacterial mouthwash. Combined with a range of ingredients it also protects and strengthens teeth, fights bad breath and protects gums. In fact, many of its users comment on how it helps with sore gums. While it is not specifically marketed as a whitening product, it does contain ingredients that will lift stains. It is a little more expensive than a regular toothpaste – though cost need not be a deal breaker as money saving multi packs are available. The active ingredient in Listerine toothpaste is sodium monofluorophosphate (view details). This is one of three types of fluoride accepted by the Food and Drug Administration (FDA) to help prevent tooth decay. Fluoride works with saliva to strengthen tooth enamel and protect it from the effects of sugar and plaque. Artificial sweeteners that do not cause cavities are used to sweeten the gel and several ingredients including phosphoric acid and hydrated silica are used to lift and remove stains. These ingredients are common in many toothpastes and they do the job they have been designed to do. However, what makes Listerine different is it uses ingredients with antiseptic qualities to specifically reduce the bacteria load in the mouth. Acid producing bacteria contribute in different ways to tooth decay, plaque build up, bleeding and sore gums, ulcers and bad breath. For this job the main ingredient is Thymol (found in Thyme oil) which helps to give Listerine its distinctive taste. Users like the fresh taste and feel of Listerine and it scores 4.3 in reviews. The relative dentin abrasivity of Listerine is low which means that it is very unlikely to cause damage to the tooth’s enamel. The toothpaste avoids the use of natural sweeteners to eliminate the risk of tooth decay. One slight concern is the use of phosphoric acid to lift stains. The normal ph in your mouth should be very close to neutral. If it becomes too acidic then those acids will attack and erode tooth enamel. The use of Sodium monofluorophosphate and sodium disodium phosphate help to both inhibit acid erosion and strengthen enamel but there are still concerns about the use of a potentially damaging acid to lift stains. Yes, ingredients such as sodium monofluorophosphate and sodium disodium phosphate help to reduce acid erosion and remineralise tooth enamel. Sodium lauryl sulfate has antibacterial properties that can dissolve plaque. Other ingredients such as Thymol also reduce the bacteria load in the mouth and prevent acid attack, helping to protect teeth and gums. Only one flavor is available. Users often describe this as being very close to the mouthwash which is no surprise they both use similar flavors. Fresh, minty and slightly medicinal is probably the best way to describe it. Listerine Toothpaste is a good product from a company with a proven record for fighting the bacteria that cause a range of oral health problems. Combined with its fluoride formula it also protects and strengthens teeth as well as lifting stains. However, if you want a good antibacterial toothpaste but are concerned at the inclusion of certain ingredients such as phosphoric acid or sodium lauryl sulphate you may want to consider other options instead. One possibility could be pairing a more gentle whitening toothpaste, such as Hello Toothpaste, with the standard Listerine antiseptic mouthwash which is free from both phosphoric acid and SLS. -> For alternative toothpaste options, visit our toothpaste reviews. While Listerine Toothpaste is more expensive that some other brands, multipack options are available which can help to bring the overall cost down. Listerine Toothpaste puts a strong emphasis on killing the germs that cause a range of oral health problems. It also removes stains and contains fluoride to protect teeth and and strengthen tooth enamel. However, the use of phosphoric acid to remove stains is a slight concern for some, though the inclusion of fluoride and and sodium disodium phosphate should help to limit acid erosion and remineralize enamel. Overall, the strength of Listerine Toothpaste is that it is antibacterial, fighting oral health problems right at the core. Is Listerine Toothpaste American Dental Association approved? No – only one flavor is available.